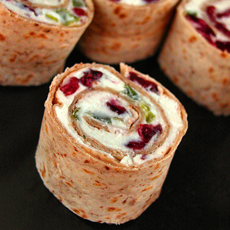 Cranberry-feta pinwheels in tomato tortillas. Here’s the recipe from Food.com. When we were in grade school (do people still use that term? 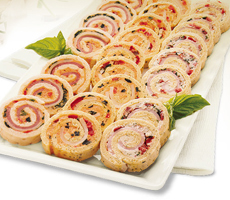 ), pinwheel sandwiches were a special party food. The bread needed to be specially baked, thin enough to roll into pinwheels. We delighted in them, and were even happier when the bread was baked in red and green loaves for Christmas, pink and blue for baby showers. Fast forward 30 years: Tortilla wraps have taken over; and since they are made in different colors/flavors, there’s no need to tint dough and bake bread. 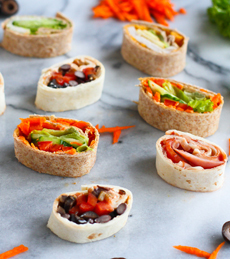 Pinwheels are as easy to make as any wrap sandwich, so we now enjoy them regularly. For the holidays, serve them with cocktails, or bring them as your contribution to a party. Make a double or triple recipe. They go fast, and you can freeze any leftovers. BONUS: They can be made the night before. The following recipe from Hidden Valley has bits of red and green accents for the holidays, but you go whole hog with the variation below. *The 2¼ ounces equals about 4 tablespoons. We prefer the flavor of loose olives to many canned slices, which can be bland. We buy quality pitted olives from our market’s olive bar and slice them ourselves. 2. BLOT dry the pimientos, chiles and olives on paper towels. Sprinkle equal amounts of over the cream cheese mixture. 3. ROLL up the tortillas tightly, and cover them in plastic wrap or foil to hold their shape. Chill at least 2 hours. 4. CUT the rolls into 1-inch slices. Discard the ends (we discarded them right into our mouth). Plate with the spirals facing up. Garnish the plate as desired and serve. You can further provide a dip: guacamole, onion or ranch dip, salsa, etc. If you need a video, here. Start by considering your favorite ingredients (ours: smoked salmon, cream cheese, capers), then an accent or two (dill, salmon caviar). Fresh herbs (dill, for our sandwich) really bring up the flavor. Alternatively, think of your favorite cuisine: French, Greek, Italian, Mexican? Assemble your ingredients on that theme. Another option: Take a look at all the varieties in Google Images, until you find the combination of ingredients that you like. 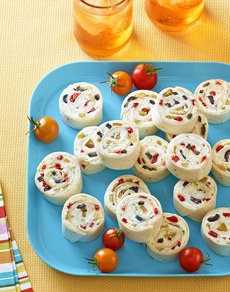 Have fun with pinwheel sandwiches, and make them often! 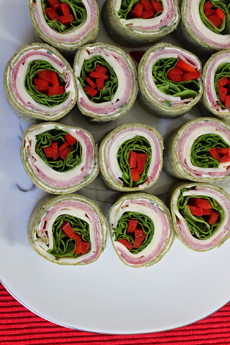 TOP PHOTO: Ham and cheese pinwheel sandwiches with holiday colors. Here’s the recipe from Lynda’s Recipe Box. MIDDLE PHOTO: Five different flavors and colors from The Pioneer Woman. BOTTOM PHOTO: Think of how you want to present your pinwheels. Maybe form a Christmas tree? Photo courtesy Nancys.com.